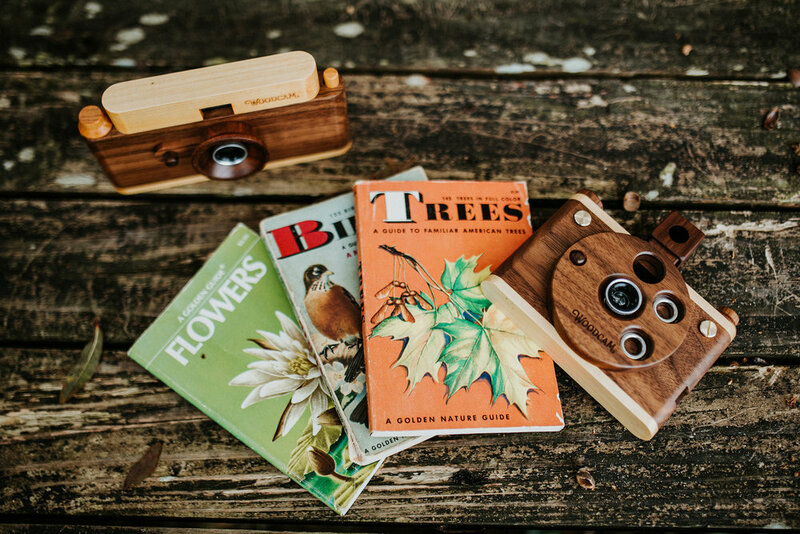 As a photographer mama of two five year old boys, I was delighted to discover the Father's Factory Digital Woodcams! Our family received two of them-- one in the "Classic" design, and one in the "Vintage" design. I was immediately struck by the beauty of these charming little wooden digital cameras! They are made of stunning, high quality walnut and cloud Cypress wood. The cameras come disassembled, but are easy and fun to put together--packaged in a wonderfully organized case with everything you need (except the two AAA batteries). With lovely design, ease of use, and simple charm, these are an excellent novelty for any photographer and/or a perfect first camera for a young child. I'm not gonna lie, my favorite part about the Woodcams is their great aesthetic! The look and design are totally "Instagram-able" you might say, and they have such a classic feel. Along with the camera body itself, each camera came with two cute little lenses: one wide angle lens and one fish-eye lens, which are magnetically attachable. It's simple design makes the Woodcam very easy to use. It is preset for auto exposure and auto white balance. The camera body has a built in feature which allows for 4 different shooting 'filters': color, black and white, sepia, or blue/cool tint. Unlike most digital cameras, it does not have a 'viewing' screen, which is great for developing a habit of shooting with more intention and forethought. I love that it teaches the user to focus on the process and gives the satisfaction of delayed gratification--you can only view the images later on your computer screen (the necessary attachment is included in the kit).